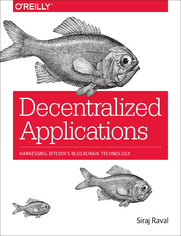 Take advantage of Bitcoin’s underlying technology, the blockchain, to build massively scalable, decentralized applications known as dapps. In this practical guide, author Siraj Raval explains why dapps will become more widely used—and profitable—than today’s most popular web apps. You’ll learn how the blockchain’s cryptographically stored ledger, scarce-asset model, and peer-to-peer (P2P) technology provide a more flexible, better-incentivized structure than current software models. Once you understand the theory behind dapps and what a thriving dapp ecosystem looks like, Raval shows you how to use existing tools to create a working dapp. You’ll then take a deep dive into the OpenBazaar decentralized market, and examine two case studies of successful dapps currently in use.